I’ve quickly realized that I want this blog to be not just a document of the Gallery’s activities, but somewhat of a posterboard for scattered thoughts on cultural artifacts related to Native culture and americana in general. Let me therefore draw some deserved attention to an unusually stark and uncompromising depiction of American Indians – Kent Mackenzie’s film ”The Exiles”. Like the fate of many Native Americans themselves, the film has suffered from cultural invisibility for many years. I first came across clips of it in Thom Andersen’s essay film ”Los Angeles Plays Itself” and was struck by the rawness of the images. As was many others. The film has since been restored and released on DVD. ”The Exiles” begins with a sequence of Edward Curtis’s photographs of traditional Indians set to tribal drumming and chanting. But this is no return to times past. 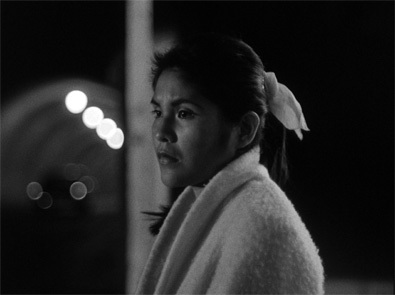 We are soon landed in 1960s Los Angeles among a group of Native Americans who have exiled from the reservation only to find themselves in an urban limbo of sorts, passing their unemployed time by drinking, fighting, flirting, and gambling. 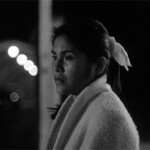 The film follows the group throughout twelve hours of their lives, beginning at nightfall and ending as a new dawn rises. 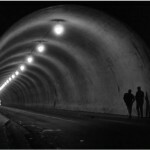 It will be a night of thunderbird-guzzling, drunken joy, drunken resignation, romantic missteps, drunk driving, air-piano playing, bar-brawling, but also of retying old collective bonds as the night is ended on the hilltops above Los Angeles where Natives young and old come together to sing traditional Indian songs. Not a documentary in the strictest sense of the term, the individuals of the film nevertheless more or less play themselves. The visual footage is complemented by a voice-over consisting of authentic interviews of the ”actors” voicing their real-life attitudes and concerns. This device supplies the apparently carefree antics with an undertow of complexity. The effect of the voice-over is particularly striking when coupled to Yvonne’s beautifully stoic face. Yvonne is the most judicious of the bunch. Being pregnant, she goes to the movies while the others go out drinking, dreaming of a brighter future where husband Homer will change his reckless ways and become a responsible father for his child. If not, she’s sure she’ll manage on her own. Somehow. In ”Los Angeles Plays Itself”, ”The Exiles” was celebrated for its respectful treatment of the city of Los Angeles. Indeed, the attention to detail makes the city come alive, taking in ambient sounds and the rundown charm and maze-like layout of the now vanished neighborhood Bunker Hill, which has been the setting for many a Film Noir. Historically, Bunker Hill was for long disconnected from the rest of Los Angeles due to its elevated placement. Later, the two areas were connected by a long tunnel through the hill. This historic background provides some opportune fodder for symbolism. 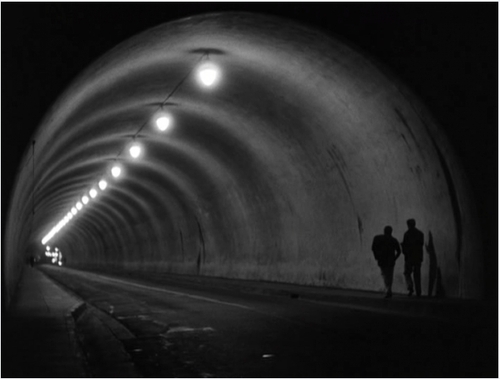 The tunnel figures prominently in the film. It thereby underscores the transitional in-betweenness suggested by Homer, of being transplanted from one culturally segregated, but cohesive, community into an urban diaspora. For some, the film is problematic for seemingly contributing to the stereotype of the drunken Indian. I think this is to miss the point. ”The Exiles” is primarily a poem of the night – of its lures and pitfalls, sure, but also of it as medium for a class of people without means to exercise a bit of freedom, however destructive this freedom may be. The darkness of night belongs to them because they are invisible even during the day. As such, ”The Exiles” stands next to Bruce Springsteen’s ”Night” as a melancholy paean to the liberations of night.